This is a recipe adapted from Cooking Light, May 2013. The first time we made it with pork tenderloin, which was delish! Tonight we used boneless chicken thighs which were equally fabulous! Seal bag and refrigerate at least 1 hour. Remove pork from bag and discard marinade. 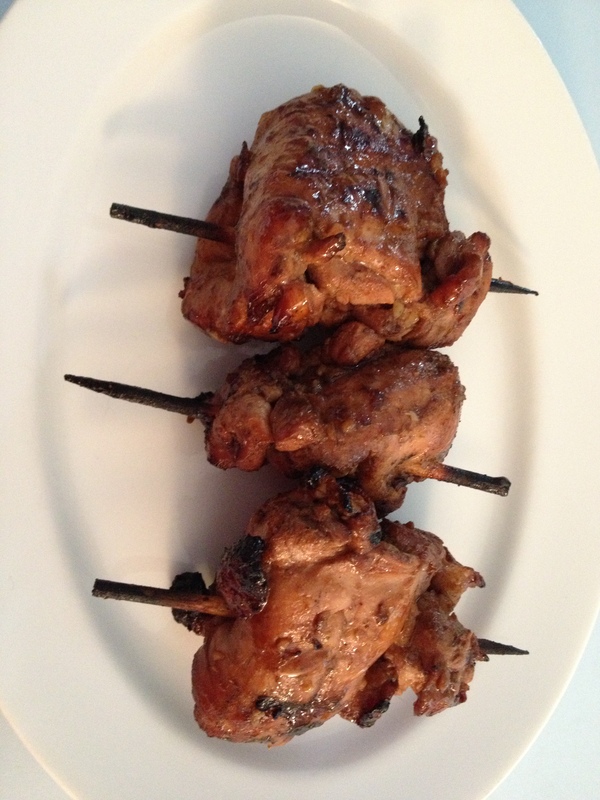 Skewer pork or chicken onto 8 6-inch skewers. Grill about 3 minutes per side. Serve with brown rice and grilled vegetables. You could easily add grated fresh ginger and sesame oil for a more Asian flavor. Posted in main dishes and tagged garlic, grill, skewers, soy sauce. Bookmark the permalink. Thanks Mary Ann and Jim! It’s nice when easy can be yummy too! here is a bit more after doing this several times now….we will serve to 15 folks tomorrow for a work party…while I am grilling, I open the Ziploc bag with the marinade and submerge the pieces as I am turning them on the grill…at least twice per piece…i.e. 2 turns…make sure the last cooking is hot enough to heat the chicken to a safe temperature. You are a grilling Master!